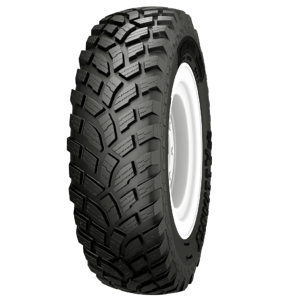 "Shipments of the new Alliance 551 are on the way and will be in stock soon," says James Crouch, Alliance Tire Americas National Product Manager—Agriculture. "That provides opportunities for municipal and commercial operators, as well as farmers, to put it through its paces in tough winter conditions." The Alliance 551 Multiuse Professional features an R-3 block tread pattern with variable-depth sipes that provide extra biting surfaces as well as directional channels to clear snow and slush from the tread surface. Steel belts provide a broad footprint for improved traction and stability, Crouch notes, and boost fuel efficiency by reducing rolling resistance. The combination of steel belts and precisely engineered lugs ensures a stable, quiet ride with a dependable grip in the snow. The Alliance 551 is rated for speeds up to 40 mph (65 km/h). Limited quantities of the new Alliance 551 Multiuse Professional will be available in six popular sizes: 440/80R24 (144D and 149D), 440/80R28, 440/80R34, 540/65R30 and 650/65R42. For more information, contact your Alliance Tire Americas sales rep.